With Earth Day coming I was feeling a little guilty about my carbon footprint. Vacationing in the desert in Arizona – was that pushing the limit? But then I encountered the Westin Kierland Resort & Spa‘s “Be Greener” program. I often find that hotels pay lip service to environmental causes, leaving a card in your room that says your towels will not be changed if you hang them up. I always hang up my towels (I really don’t see the need to change them daily – I don’t do this at home) and I return to my room to find fresh towels. Maybe the housekeeping staff doesn’t believe me? But the Westin, in the Scottsdale/Phoenix area, puts its money where its mouth is. A card in each guest room offers an incentive to decline housekeeping. You don’t get fresh towels or sheets, or even get your bed made, but you do get $5 to use at one of the resort’s restaurants. You can also avoid mini-bar charges and more trash by buying a re-usable stainless steel water bottle and refilling it at one of the water stations around the resort. The bottle itself is $10, but since the air is so dry in the desert, you need a lot of water, and you can easily save a few bucks after just a day of refilling the bottle. 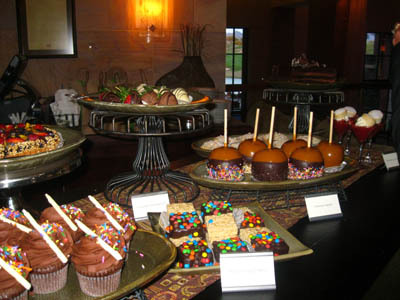 Dessert in the desert: nightly dessert bar at the WestinThe Westin also emphasize environmental choices in its food offerings, with healthier ‘superfoods’ and vegetarian options at all eight food outlets. Breakfast is one of the easiest meals for vegetarians, and the steel-cut oats served with dried fruit and fresh bananas made eating healthy pleasurable. The Latin-influenced deseo has a ceviche bar overlooking the open kitchen and local produce. You can even be virtuous when you drink, with a Muddle Bar offering an array of fresh fruits and herbs to put in your libation. Kids don’t always have the same environmental concerns as their parents, so the Westin incorporates fun. The resort even has a FUN Department, run by a former cruise director, who organizes family and kid-only activities. A new initiative with the Phoenix Zoo focusing on preserving the environment, but kids will be happy with the live animals they can see and touch. Parents can rest easy that the zoo program, and many of the other family activities, are free. Saving green while being green – a win win. This hotel sounds great. Hopefully more hotels will get on board with being more green. Another great way to keep your travels green is by packing and taking food with you. This way, you avoid the over packaged on the road meals and you are able to eat much healthier. I always make sure to pack bento boxes for the whole family in our Laptop Lunches. This way we all get to choose our favorite foods for the road and don’t generate any garbage along the way! You can check them out at, http://www.laptoplunches.com.